As much as I love holiday shopping, if there’s one person I hate shopping for, it’s Derek. I’m sure he will give you the same response when it comes to shopping for me. We tend to pick up items that we want throughout the entire year, so we don’t normally need or want anything when Christmas rolls around. Year after year, I’m left wondering what to get him. He really doesn’t need anything. That being said, it wouldn’t be the holidays without a few gifts in his stocking. So, if you’re anything like me and stuck with what to get your man this season, I have a few stocking stuffers ideas for you. 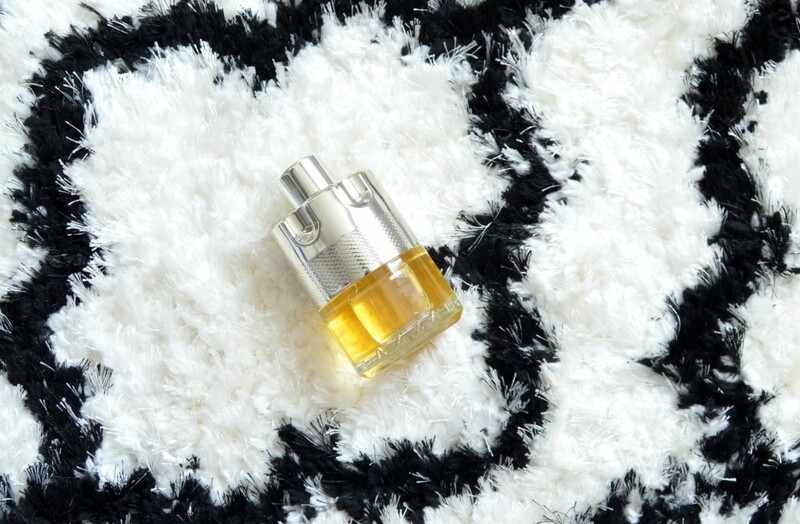 A new scent to ring in the new year with, is never a bad idea. 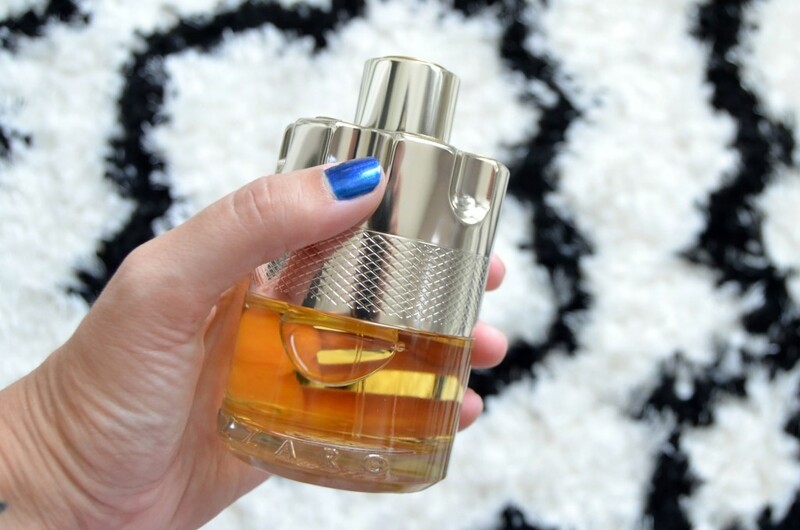 Azzaro Wanted is a woody, spicy and citrusy fragrance that’s perfect for the modern-day man. The bottle is a real work of art, and is supposed to represent a sports car piston. Its faceted by rounded geometric shapes inspired by some of the brands codes, like the ring, a key Azzaro identifier. With trendy materials, such as ginger, lemon dup, cardamom, pyrogenic prickly juniper, vetiver and Tonka beans, instantly gives it a modern cut and impeccable hang, just like a handsome suit. It retails for $72 for 50ml and $92 for 100ml. 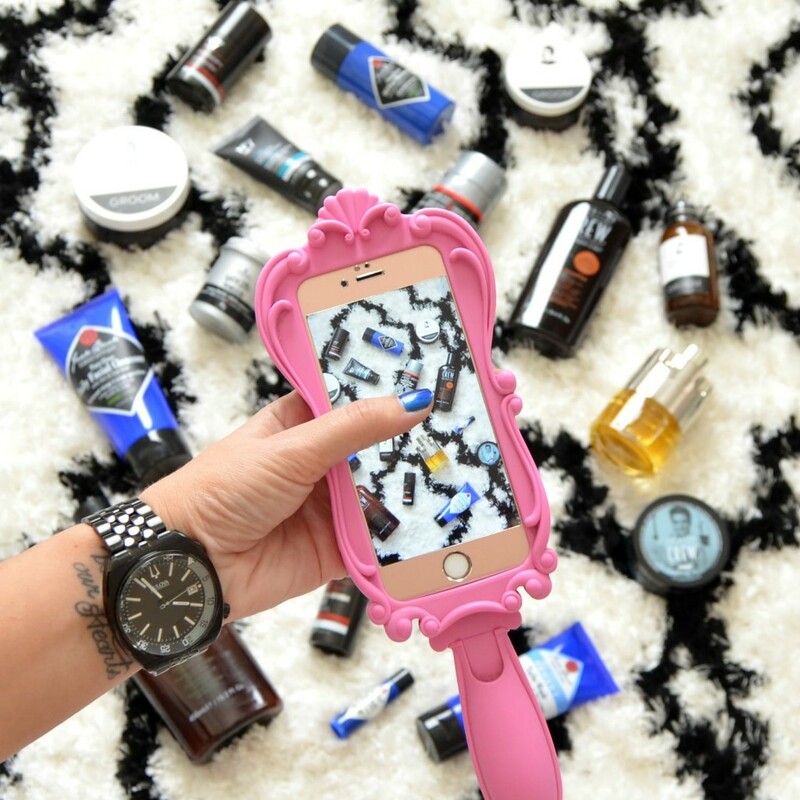 Let’s be honest, our men love luxury products just as much as we do. 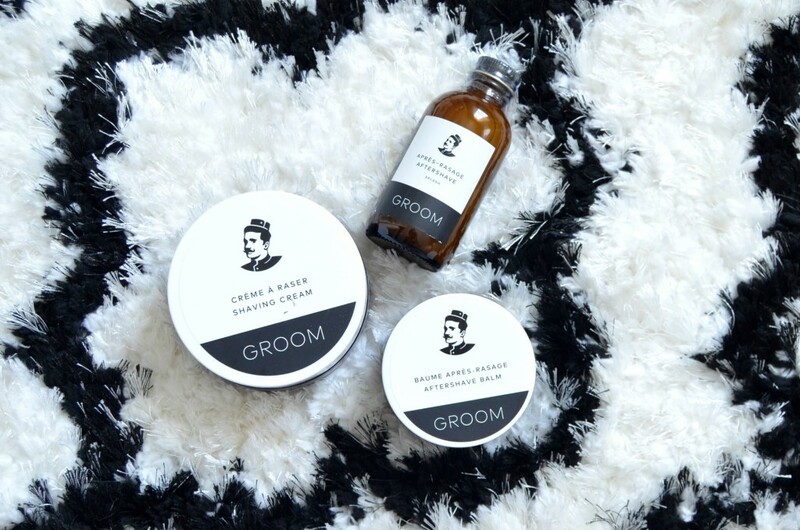 Groom is a fine grooming brand, handcrafted out of Montreal, designed and created in small batches to guarantee freshness. Each creation is made from high quality, natural ingredients to ensure their customer gets nothing but the best product. Groom Shaving Cream not only has a rich and creamy texture for easy application, it helps allow the razor to glide effortlessly across the skin. Its gentle and delicate formula is perfect for those with sensitive skin, as it doesn’t clog pores or cause breakouts. It has a lovely, yet manly aroma of pine, sage and juniper. Simply apply a small amount to wet skin and massage in using your fingers. It instantly transforms into a thick, foamy lather, ensuring you will never get razor bumps or knick the skin. It retails for $24 for 145ml. Groom Aftershave Balm is enriched with cacao seed butter to give It a lightweight, yet extremely thick, white creamy texture that absorbs into the skin instantly. It helps to provide long lasting moisture without feeling sticky, greasy or oily. It features a fresh, almost misty/ herbal aroma that not only helps awaken and invigorate the senses in the morning, it helps provide a light cooling and refreshing effect on the skin after shaving. It helps to leave skin healthy, soft, smooth and hydrated the entire day. It retails for $22 for 90ml. Groom Aftershave Splash features a unique blend of natural ingredients, including bee propolis extract to help balance, moisturize and soothe the skin after shaving. For those that don’t like a rich aftershave balm, this provides the same hydrating effects, in an oil format. It has a lovely scent of vetiver, juniper and lime. It retails for $26 for 100ml. Jack Black has done an excellent job at creating a brand for those men that don’t like to spend a ton of time in front of the mirror, but still want to look put together. Each product is convenient and multi-functional to get him in and out of the bathroom as quickly as possible without sacrificing effectiveness. Jack Black Pure Clean Daily Facial Cleanser with Aloe & Sage Leaf is a 2-in-1 liquid cleanser than not only gently removes all traces of dirt, oily and daily grime, it also doubles as a toner. It helps to clean skin and prep it for shaving. Skin is left feeling soft, smooth and hydrated. It retails for $23 for 177ml. 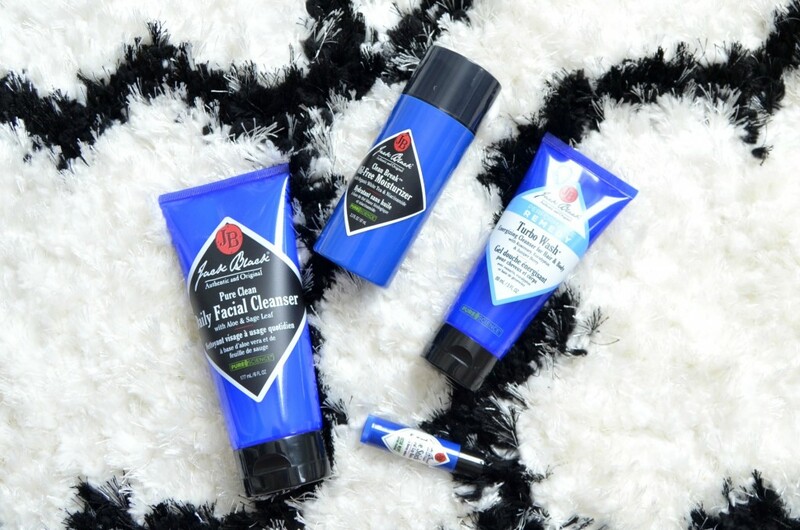 Jack Black Clean Break Oil-Free Moisturizer is a lightweight, transparent gel-cream, oil-free facial moisture designed and created for all skin types. It instantly penetrates deep down into the skin for all day moisture, hydration and shine-free complexion. With daily use, it can help with dullness, uneven texture, oiliness and uneven skin tone. Its formulated with an organic botanical blend of organic basil, white tea, and sea kelp to not only help nourish the skin, but it helps to replenish the skin’s moisture level and provide a slightly cooling and soothing sensation. It’s the perfect daytime moisturizer for after shaving. It retails for $39 for 97ml. Jack Black Performance Remedy Turbo Wash™ Energizing Cleanser for Hair & Body is a 2-in-1 cleanser that energizes, awakens, revitalizes and jump-starts your immune system. It features both rosemary and eucalyptus to naturally support your immunity by reducing bacteria on the skin’s surface, perfect for this time of year. It can be used on both body and hair to help get you going in the morning. It retails for $12 for 88ml. Jack Black The Stick Natural Lip Balm is a brand-new product and if your man loves the OG Moisture Therapy Lip Balm, he’s going to love this. Same great nourishing ingredients, but in a convenient roll-up stick design. Its smooth, non-waxy texture glides across the lips with ease and helps cure dry, chapped, irritated lips. It features cocoa butter, jojoba oil, vitamin C and natural peppermint oil to help hydrate, heal and protect the skin. It has a refreshing cool mint flavour that’s refreshing and invigorating on the lips. It retails for $10.50. An excellent skincare drugstore option goes to No7 Men. 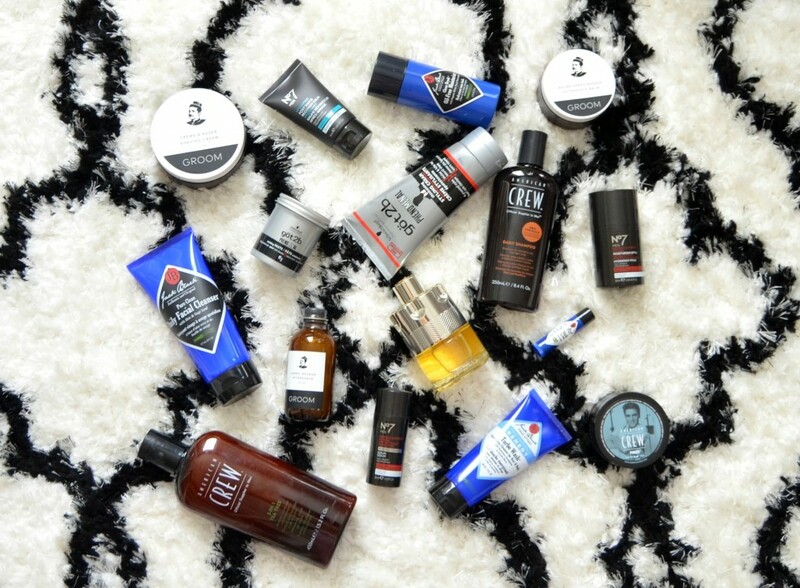 Found at your local Shoppers Drug Mart, No7 Men offers a wide range of dermatologically tested men’s skincare products. Boots No7 Men Protect & Perfect Intense Moisturiser SPF 15 prevents both sunburns and wrinkles at the same time. Even in the dead of winter, it’s important to wear your sunblock, but how many men actually take the second step to apply this? Not only will it help to protect from harmful UV rays, its unique ingredients help to also boost collagen and elastin, improving the appearance of deep lines. Applied as soon as he gets out of the shower, this rich and creamy formula absorbs into the skin within seconds, so he can get on with his day. It retails for $26 for 50ml. Boots No7 Protect & Perfect Intense Advanced Serum is a powerful, yet lightweight serum that helps reduce the appearance of fine lines and wrinkles. It delivers anti-ageing results that improve with each use. It instantly helps give the appearance of healthier, smoother, more hydrated skin. It boosts collagen and elastin to help smooth out fine lines. It also helps to prevent damage from free-radicals, sun-exposure and pollution. Vitamin A helps to normalize skin cell renewals for younger looking skin in days. It retails for $29 for 30ml. Boots No7 Hydrating Post Shave Recovery Balm features a slightly cooling and calming, gel-like texture that helps to immediately add moisture and hydration back into dry, dull skin. It also helps to soothe, calm redness and irritation and help nourish the skin after shaving. Hash shaving creams and dull razors can strip away moisture, causing bumps, cuts and knicks, this balm can help calm the skin. It retails for $13 for 50ml. 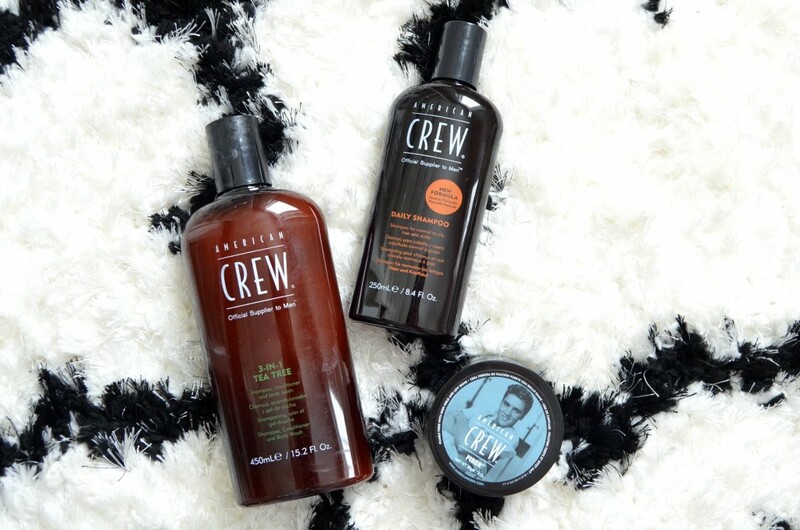 American Crew features an entire lineup of men’s grooming products designed to bring men into the salon. 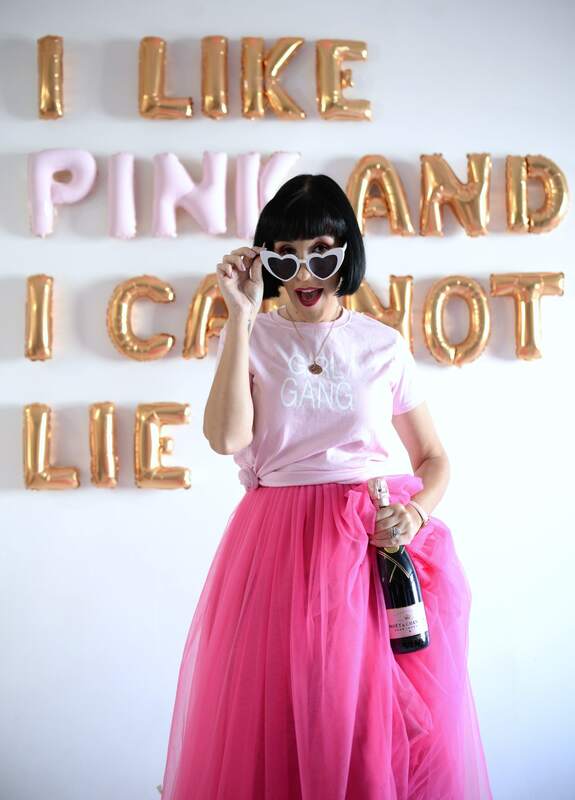 Their goal is to provide them with a great experience and teach them tips and tricks that they can incorporate into their daily styling routines at home. Your man can now groom like the King himself, with the new limited edition Elvis American Crew Fiber. It’s unique fiber-like, resinous texture helps to thicken, texturize and increase fullness to the hair. It helps to provide a strong, yet pliable and moveable hold with a matter finish. It retails for $21.95. American Crew 3-in-1 Tea Tree Men is designed and created for both the body and hair. This is perfect for the guy who doesn’t want to fuss with multiple products. It comes to a creamy lather like a luxury shampoo, nourishes the hair like a hydrating conditioner and cleanses and softens the body like a foamy body wash. It lathers up beautifully, washes clean away with any residue and deodorizes and refreshes the entire body for upwards of 8+ hours. It retails for $19.95 for 450ml. American Crew Daily Shampoo is a plant-based, mild cleanser that gently cleanses all hair types. It helps to protect coloured hair, increase shine and control sebum production. It helps to reduce bacteria, comes to a creamy lather and breaks down excess oil. It washes clean away with no product build-up or greasy, heavy residue. It instantly leaves hair soft, silky, smooth and with mega shine. It retails for $12.95 for 250ml. göt2b Phenomenal line features optimum styling polymers and patented powder technology to leave hair noticeably thicker in a single use. göt2b Phenomenal Thickening Styling Cream has a lightweight, thick, creamy texture that works into dry or damp hair to provide a thicker, groomed style. It instantly helps to add volume and fullness to the hair, which gives the appearance of thicker hair. It looks and feels extremely natural, with movement and bounce. No sticky or greasy residue. It doesn’t look or feel crunchy, stiff or hard, just flexible, soft and resilient movement. It retails for $8.99. 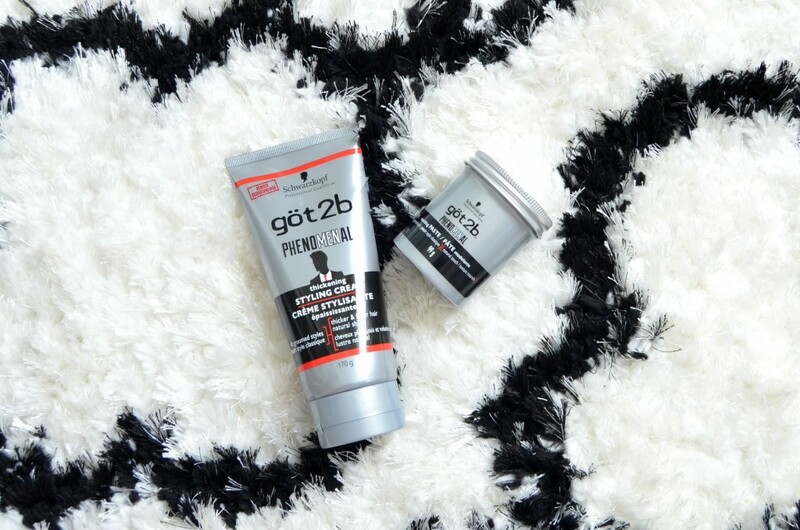 For the finishing touch, apply a small amount of göt2b Phenomenal Moulding Paste to any hair style. IT helps to set and shape the hair within seconds. This shaping pomade provides thickness, hold and style with only the smallest amount. Its unique texture is in between and wax, paste, and cream. It helps control unruly hair and gives a natural, just out of bed, yet polished look. It also does a wonderful job at texturizing and setting your style in place. It never looks or feel stiff or crunchy. It retails for $8.99.